JESSICA DESVARIEUX, TRNN PRODUCER: Welcome to The Real News Network. I’m Jessica Desvarieux in Baltimore. And welcome to part two of our conversation with john powell. Now joining us from San Francisco to get his take on the recent events in Ferguson is john powell. He’s a professor of law and professor of African-American studies and ethnic studies at the University of California, Berkeley. Professor powell is also the director of the Haas Institute for a Fair and Inclusive Society. Thanks for being with us again, john. JOHN A. POWELL, DIR., HAAS INST. FOR A FAIR AND INCLUSIVE SOCIETY: Thank you, Jessica. Thanks for having me. DESVARIEUX: So, john, I wanted to talk to you about the role of the police and the courts even before the incident that took place between the police officer and Michael Brown it Ferguson. What was that relationship like? POWELL: Well, it was a very disturbing relationship. It was a low-grade wrath harassment. And there’s a study of that shows this. Ferguson is a small town. It has 8,000 households. Last year they had more than 12,000 warrant cases and Ferguson’s–and more than 24,000 warrants being issued, and most of them were directed at the black community. So if you’re black in Ferguson, you’re likely to be stopped by the police, you’re more likely to be searched, you’re more likely to be issued a warrant than your white counterpart. And the think that’s interesting is that when they do the searches, they find–they actually find contraband more often on white people than on black people. And yet black people are being stopped, they’re being searched, and they’re being fined. And they’re using this partially just to fund the town. The second-largest source of revenue is from these fines. So they’re actually milking over $2 million–a town of 21,000 people–have come from these fines last year. And so the black community felt like the police are not there to protect them; they’re there basically to police them and to extract money off them. And the courts actually participate in this. So it’s really a system that’s not just, again, hostile in Ferguson, but we see a similar system operating through much of the United States. Only recently, there was a ruling that–throughout the United States many prisons would charge as much as $17 a minute for a call for inmates–$17 a minute. And recently the federal government actually stopped that practice. So using the criminal justice system not only to harass people and police people but also to extract resources from the community. DESVARIEUX: And, I mean, in the case of the prisons, are we seeing more of these policies as more and more prisons become privatized? POWELL: Yes. I mean, it’s problematic on so many different levels. Yes, we’re privatizing prisons. We only had five /praɪzən/ prisons 20 years ago, and now we have over 100, hundreds of thousands of prisoners being incarcerated, and ways of making money. 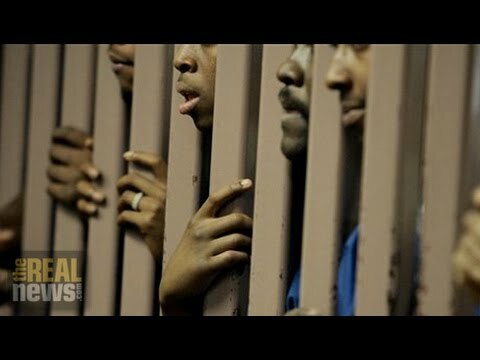 We’re also locating many of these prisons not in the black community, where a disproportionate number of inmates come from, but in the rural white community as a way of creating jobs, and as a way of creating political clout, because the prisoners count for apportionment, for voting apportionment, but they don’t get a chance to vote. It reminds us of the Three-Fifths Clause, when black slaves used to count for the portion of [House then represented (?)] in apportionment, but they didn’t get the right to vote. We’re seeing the same system in place throughout the United States, only worse, ’cause instead of Three-Fifths, the count is a full person, to the point of giving more political clout to rural white areas, as well as jobs. DESVARIEUX: Break that down for me, john, ’cause it’s very interesting. So give me an example. POWELL: So the number of congresspeople you have in the area depend on the number of people who live in the area. And so the more people, the more representatives you get. That’s also used to decide how many electors you get in the electoral college in the vote for the president. So it’s actually quite important. So you want as many people, as many electorates, and as many congresspeople as possible. So if you take the home of prisoners, inmates, as where they’re housed, then, since they’re housed in majority-white rural areas, it increase the voting power, the population count, for those communities. So they get an extra congressperson, which means also they get extra weight in terms of electing the president. And the black people are counted for the purpose of increasing the number, but they’re not allowed to vote. Only two states allow people who are incarcerated to vote, to vote while they are incarcerated. So we count them for the purpose of increasing number, but not–it doesn’t benefit them; it benefits the white community that they’re housed in. DESVARIEUX: Which two states are those that allow prisoners to vote? POWELL: Rhode Island and Maine, if I’m not mistaken. POWELL: Both, as you know, have very small black populations. DESVARIEUX: Okay. John, I really want to have you back on the program. This has been such a fascinating conversation. Thank you so much for being with us. POWELL: Thanks for having me, Jessica.